Dodge cars, dogs and tornadoes as you grow your subscriber base and expand your paper route in this arcade-inspired newspaper delivery game. If you thought delivering newspapers was easy, you haven't seen a neighborhood like this one. 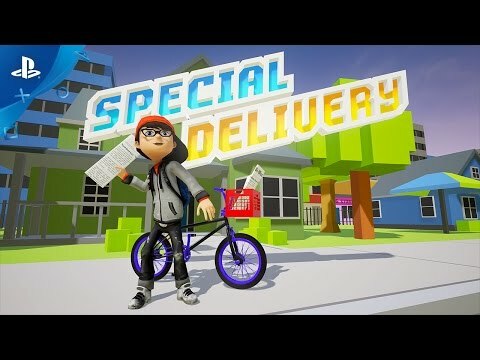 Hop on your bike and get to delivering but you better watch your back! You'll start out with a small, single-street route. But if you actually manage to stay alive after each week and prove your usefulness, management will expand your route and you'll have to service more customers. ....oh, and keep an eye out for the Daily Inquisitor delivery team on Sundays, they're nasty. Traps including cars, dogs, tornadoes, grannies and more! Interactive objects...gain bonus points for smashing lawn gnomes, knocking over trashcans and breaking windows of non-subscribers! 28 Rounds. Progress through 28 game days unless you lose all your subscribers before then! Four neighborhood sections with almost 200 potential customers. Route expands into a new section each game week. ”Sunday Special Edition” At the end of each game week, players collect coin pickups to pay for all the tossed papers while encountering boss fights with the rival paper. All while still keeping up with their daily deliveries!